O glorious Saint Therese, whom Almighty God has raised up to aid and counsel mankind, I implore your Miraculous Intercession. So powerful are you in obtaining every need of body and soul our Holy Mother Church proclaims you a "Prodigy of Miracles...the Greatest Saint of Modern Times." Now I fervently beseech you to answer my petition (mention specifics here) and to carry out your promises of spending Heaven doing good upon the earth...of letting fall from Heaven a Shower of Roses. Henceforth, dear Little Flower, I will fulfill your plea "to be made known everywhere" and I will never cease to lead others to Jesus through you. St. Therese of the Infant Jesus, Patroness of Missions, pray for us! On each of the remaining 24 beads say 1 Glory be in honor of the Blessed Trinity, in thanksgiving for giving the world the Little Saint who lived only 24 years. St. Therese, the Little Flower, please pick me a rose from the heavently garden and sent it to me with a message of love. Ask God to grant me the favor I thee implore and tell Him I will love Him each day more and more. Lamb of God, Who takest away the sins of the world, graciously hear us, O LordLamb of God, Who takest away the sins of the world, have mercy on us. O God, Who didst inflame with Thy Spirit of Love the soul of Thy Servant Therese of the Child Jesus, grant that we also may love Thee and make Thee much loved. Amen. 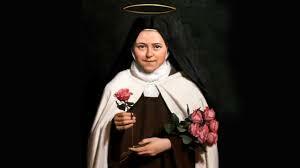 Dearest Saint Therese, you are the Little Flower of Jesus. Pray this day that I may be made well in body, mind, and spirit. Help me to always see, as you so clearly did, that my sufferings and trials are meant to cleanse and purify me so that I may be more worthy to receive God's unending Love. Amen. Thought for the day: Confidence in God. We can never have too much confidence in the good God who is so powerful and so merciful. We obtain from Him as much as we hope for. If you are nothing, do you forget that Jesus is everything? You have only to lose your nothingness in His Infinity and think only of loving Him. Thought for the day: Abandonment to God. I fear only one thing---to keep my own will; take it, my God, for I choose all that You choose. The only happiness here below is to strive to be always content with what Jesus gives us. I can demand nothing with fervor, except the perfect accomplishment of God’s will in my soul. O my Beloved, I offer myself to You, that You may perfectly accomplish in me Your holy designs, and I will not allow anything created to be an obstacle in their path. Thought for the day: Patience in Sufferings. I do not fear trials sent by Jesus, for even in the most bitter suffering we can see that it is His loving hand which causes it. When we are expecting nothing but suffering, we are quite surprised at the least joy; but then suffering itself becomes the greatest of joys when we seek it as a precious treasure. Far from resembling those beautiful saints who practiced all sorts of austerities from childhood, my penance consisted in breaking my self-will, in keeping back a sharp reply, in doing little kindnesses to those about me, but considering these deeds as nothing. Thought for the day: Zeal for souls. Let us work together for the salvation of souls. We have only the day of this life to save souls and to give them to the Lord as proofs of our love. I tell Jesus that I am glad not to be able to see, with the eyes of my soul, this beautiful heaven which awaits me, in order that He may vouchsafe to open it forever to poor unbelievers. I cannot perform brilliant works; I cannot preach the Gospel or shed my blood. But what matter? My brothers work in place of me, and I a little child, keep very close to the royal throne. I love for those who are carrying on the warfare. My deeds, my little sufferings, can make God loved all over the world. Thought for the day: Death. It says in the catechism that death is nothing but the separation of the soul and body. Well, I have no fear of a separation which will unite me forever with the good God. I am happy to die because I shall be able to help souls who are dear to me, far more than I can here below. Life is not sad; it is very joyous. If you say, "This exile is sad," I understand you. We are wrong to give the name "life" to something which will end; it is only to the things of Heaven that we should apply this beautiful name.